With the chilly rain outside, I am obsessed with fleece blankets, knee-high socks, turmeric teas and hot spiced wines, and every type of baked good I can create in my oven! This Beet and Blueberry Almond Oatmeal Cobbler is brimming with warmth and flavor. Why beets and blueberries? Why not? Beets and blueberries are vibrant and healthy and pair beautifully with the sweet blueberry taste and smoky earthy flavor from beets. This scrumptious recipe is from one of my favorite food blogs: The Nourished Seedling, which features the most uniquely stunning culinary creations (in our Tasty Tuesdays Interview, meet Sarah the brilliance behind this delicious dish). Beets, blueberries, and a hint of cinnamon with oats, Voila! . 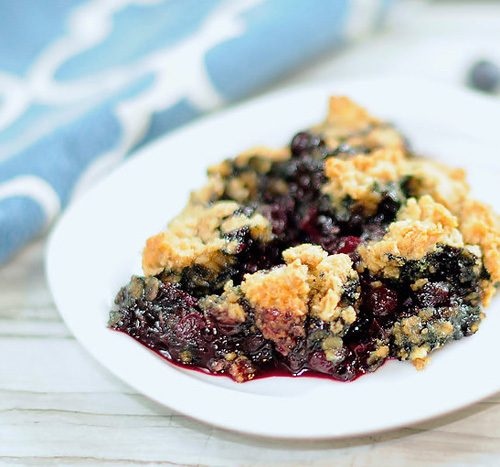 . . this cobbler is extremely delicious. Serve beet and blueberry cobbler for a breakfast treat or as a dessert with ice-cream a la mode. *Arrowroot powder contains a lot of health benefits and is used as a thickening agent. Although arrowroot powder is a healthier alternative to cornstarch, cornstarch may be used as a replacement. **I prefer to use gluten-free rolled oats. Additionally, I use almond milk in this recipe; however, the original recipe uses whole milk. Use whichever milk type you prefer. Keep me posted on any recipe adaptions. I love learning about new ways to create recipes. Cheers! 2. Combine blueberries, beets, sugar, vanilla, butter, salt and maple syrup in a saucepan. Bring to a low boil and cook for about 10 minutes on low heat. 3. Slowly mix in arrowroot powder. If you’re concerned about clumping, you can take a few tablespoons of the berry/beet mixture and mix it in a small dish with the arrowroot powder to help it dissolve. 4. Let the berry/beet mixture cook and thicken on low heat for another 10 minutes, stirring frequently. 5. While the mixture is cooking, mix the remaining ingredients for the cobbler topping. 6. In a large bowl, combine the oats, sugar, almond flour, baking soda, salt and cinnamon. Mix well. 7. Dice the butter into cubes and cut into dry mixture with a pastry cutter (or a fork if needed). Add in milk and mix together. 8. In a greased baking dish (I used a 10.5 x 7 inch Emile Henry Oval Baker ), pour the berry/beet mixture. Break the topping into little pieces with your hands and crumble over the top. 9. Bake at 375 degrees for about 25 minutes. You may want to place a baking tray on the rack below the dish, so the bottom of the oven is protected from any bubbling over. Remove from oven and let cool before serving. Photo and recipe adapted from The Nourished Seedling.